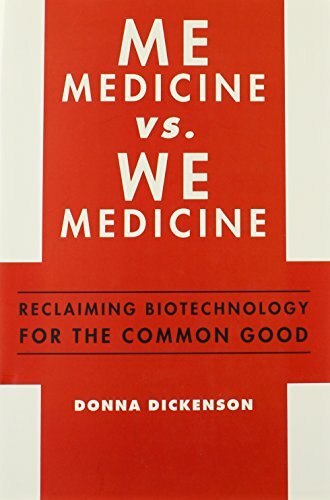 ME Medicine versus WE Medicine: Reclaiming Biotechnology for the Common Good by Donna Dickenson is described as a book that challenges some of the commonly held beliefs about personalized medicine. According to Ms. Dickenson, not so fast! In an assiduously referenced and scrupulously unbiased investigation of the state of genetic research and its current applicability to clinical medicine, this book lays open multifaceted information allowing the reader to make their own decisions. In general the author’s posture is not that personalized medicine is bad or harmful. It clearly has significant uses and benefits. In the early 21st-century however, the seemingly inevitable move toward personalized medicine may have significant consequences—and its promises as yet are unfulfilled. The terms “ME medicine” is used for personalized treatment based on genetic profiling. “WE medicine” stands for “one-size-fits-all” treatments as well as public health procedures such as population vaccinations. The author’s analysis shows that by emphasizing one direction (toward personalized care) we cannot simultaneously put large effort toward clinical treatment of the general population. The book postulates that there are four dynamics contributing to the growing belief that personalized medicine is in our best interests. These are Threat, Narcissism, Corporate Interests, and Choice. • Tobacco companies have funded a large measure of genetic testing for the purposes of finding groups of individuals who could safely smoke with impunity based on their genetic profile. • It is now common to “bank” a baby’s cord blood at birth for future treatment or to generate “replacement organs.” The technique utilized for obtaining the blood as performed by for-profit corporations may be unsafe for the fetus especially when compared with the procedures used by public blood banks. • Rather than increasing choice for patients, pharmacogenetic testing will create stratification of the population. Wealthy individuals may afford such expensive medications that will be out of financial reach for the general public limiting their choice. • Considerable effort was put into developing a combination medication that would be primarily effective for one racial group, namely African-Americans. It failed thus negating the vast number of ethical dilemmas it would have created. • Personalized cancer treatments are often touted as the flagship of ME Medicine. While considerably helpful for some individuals, they work only on “stupid” cancers, meaning those with only one genetic mutation. Only a small fraction of human cancers fit this profile while being of little benefit to the masses. Questions remain as to whether and when such techniques will have large-scale applicability. • Several courts have ruled that families who contribute their genetic samples to doctors, hospitals and corporations in hopes of promoting a cure for a familial disease will lose control of the results, the subsequent treatments and any profits generated. • The benefits of DTC genetic testing are so unreliable and of minimal use that 13 states prohibit sale of these tests and 12 more allow only certain tests under a doctor’s oversight. In reality simple gathering of family illness history information is considerably more helpful in predicting future illness than the genetic testing available in 2013. While not startling, this book also gives multiple examples of how genetic abnormalities are far from the Mendelian “one gene one trait” concept that most of us learned in high school biology. There are multiple factors including gene interaction and regulation, differences in protein expression, and major environmental influences that make an analysis of genomic material only one piece of a medical assessment. The example of the ApoE4 gene as a possible cause for Alzheimer’s disease is particularly illustrative. Even though the presence of this gene abnormality has been connected to Alzheimer’s, a full 77% of those who are positive for the gene mutation do NOT get Alzheimer’s disease. Likewise, of those who test negative for this gene abnormality, 40% DO develop Alzheimer’s disease. Thoughts about personalized medicine are like gambling at a casino. We anticipate being winners or we wouldn’t go. This text forces us to consider the outcome of being in the “other” group with a poorer genetic match. Will any new treatment be available to those with an “unfavorable” genetic profile? What likelihood of a positive response will be necessary for the drug to be funded by insurance—40%, 60%, 80% or more? This book is filled with clearly explained, hard science, giving equal treatment to the benefits and problems of personalized medicine. My one critique of this book is that despite the author’s clear style, it is not easy reading. While the issues raised could be presented without elaborate substantiating information, it is unlikely that a book like this could be written any other way and still have the power to open our eyes. I recommend expending the necessary reading effort not only for healthcare workers but for the general public. ME Medicine versus WE Medicine is also informative for individuals who may be tempted by glitzy ads to purchase expensive DTC genetic tests when the current likelihood that their financial outlay will not result in significant benefits. In the last few pages a brief overview of possible solutions to the ME-WE dilemma are discussed. Ms. Dickenson’s position is clearly stated although one will have guessed it already. No doubt she will cheer the recent Supreme Court decision to prohibit the patenting of genes as a way of slowing the rush to ME and promoting the WE.